Tesco, Britain's biggest supermarket, has seen UK growth slow after poor summer weather, but half-year underlying profit rose 14% to £1.32bn. Like-for-like UK sales excluding petrol were up 3.5% in the six months to 26 August, marking a slowdown from the first quarter but ahead of forecasts. The UK slowdown came after the firm warned in June of a "tougher year" ahead following higher interest rates. 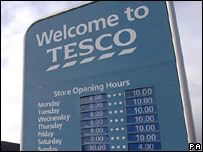 Tesco's international sales saw like-for-like growth of 1.2%. The firm said it had delivered "strong first half progress across the group, despite the challenges posed by start-up investment required to establish new US and Direct businesses". Tesco is to open in the US under the name Fresh & Easy, in Los Angeles, Las Vegas and San Diego. Around 60% of the firm's group sales - which reached £24.7bn for the half year - come from international operations. UK like-for-like sales growth - which strips out the impact of new stores - fell to 2.4% in the second quarter of the financial year, after rising 4.7% in the first quarter. "The pattern of our trading in the first half was unusual," said the firm. While first-quarter results beat expectations, sales subsequently slowed during June and July following "a prolonged period of unseasonably cold, wet weather, compared with the particularly warm, early summer last year". "The business model remains sound, with the company's continuing diversification helping to offset weather related difficulties in the core UK marketplace," said Keith Bowman, equity analyst at Hargreaves Lansdown Stockbrokers. But he added: "nerves do remain, another Competition Commission enquiry is still to be overcome and Tesco is soon to commence battle in what has become known as the graveyard of UK retailers, the US." The firm said it would continue to work with the commission ahead of provisional findings expected later in October, before a final report comes out in March 2008. The latest results come after Tesco completed a 65% acquisition of Dobbies Garden Centres. The firm said Dobbies would become a platform for the group to "encourage green consumption for those looking for sustainable solutions, from water recycling, to wind and solar power".